Shocking but true! The pace of technological breakthrough remains unabated and hot on the heels of the iPhone and that stuff you can spray round your house to get rid of the smell of dogs and mackerel comes spreadable biscuits. If any of you have been feeling an unfulfilled void gnawing at you every time you go the cupboard to get something to spread on your toast, because none of it tastes like those little continental biscuits you sometimes get given with your coffee when on holiday in France then your anguish is at an end. A couple of years back when asked to take part in a Channel 4 program about the KitKat when it was at the peak of its derivative product madness, I was asked to speculate what they might do with it next. On the spur of the moment I said 'some kind of spread that you could put on your toast'. I was fairly pleased with that, but I really honestly didn't think that some crazed biscuit doctors would ever make this leap. If they did I was also mainly expecting it to be in a squirty tube a bit like Primula Cheese spread and not a really quite big jar. Belgian biscuit baker Lotus well known for their Caramalised Biscuits and Speculoos has found a way turning biscuits into a spread. This seems to be grinding them up with some vegetable oil, sugar and emulsifier much in the way peanuts might find themselves ending up in peanut butter. 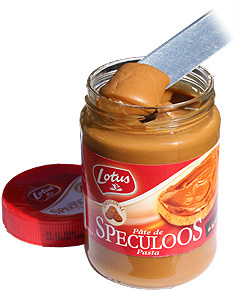 The upshot of this is that it tastes almost exactly like Speculoos, just is peanut butter tastes just like peanuts. Beyond breakfast I can see this new technology being put use in two important areas. The first as new form of biscuit adhesive for making advanced types of birthday cakes. In fact I reckon you could pull off a half decent Jabba the Hut's sail barge sticking on the window shutters with a jar of this stuff. The second and perhaps more obvious use is in the manned exploration of Mars. Biscuit crumbs in zero G during the 3 year round trip could prove quite a problem scuppering the no doubt endless opportunities for a nice float around and a cup of tea presented by 18 months in space. Lumps of this should be much better behaved in space. Demand in Belgium for the product has been overwhelming, and if there is any of it spare Lotus UK will try and bring it to our supermarkets. This summer has been fairly bereft of any summery weather. Especially when like team NCOTAASD you head off to Ireland before the brief heat wave of July only to return again some three weeks later safely accompanied across the Irish sea by downpours of torrential rain. So yes three weeks of camping around the emerald isle is now well and truly under our belts. To put this into perspective when we next bleat on about some charity event that we have become embroiled in and are looking for sponsorship, perhaps you might want to retrospectively sponsor the putting up and down of one large family tent in the rain four times. In between times we did manage to finally track down that pinnacle of Irish biscuit bar excellence the Club Milk, ancestor of the UK's Club biscuit and recently restored back to its proper configuration and glory. I recently travelled on Flybe from Norwich to Manchester and was served one of your biscuits with a hot drink. I wanted to mention to you what a delightful biscuit was served. It made all the difference to the plane delay. I was ready for a little tasty delight. I'm not sure how you got hold of one of my biscuits as I tend to make them on a Saturday and keep them in a tin, till Sunday when the youngest member of staff plays football. We have a flask of tea and a few at half time. Still glad they cheered you up on the Norwich to Manchester flight. My travels to and from Norwich in the early 1980s were always via National Express coach, where one was lucky to get a cup of Max Pax instant something. As I recall the main trick with Max Pax beverages was to read the description of the drink 'Tea' or 'Coffee' on the cup as taste, smell and appearance were insufficient evidence to go on. The second import thing was to make sure that all the powered muck in the bottom had been fully mixed with the hottish water, else lumps of it could fall into your mouth as you drank it. I fear I may have wandered off the point now. PG tips is scouring the nation for people who have made outstanding contributions to the world of tea drinking. Whether you have served PG tips for decades as a tea lady, always get the rounds in at work, or have simply cheered others up over a cuppa, PG tips wants to know and wants to say a big thank you. Why the thank you? Well for some time now PG tips has been teamed up with the Rainforest Alliance to ensure the sustainable sourcing of its tea. 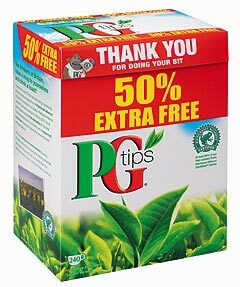 Every cup of PG tips tea drunk continues to support tea farmers and their families, so this nation of dedicated tea drinkers can give itself a pat on the back for choosing to brew up delicious PG tips tea. Brits get through more than 150 million cups of tea every day and with Rainforest Alliance�s seal of approval every sip of PG tips tea really does count! To say a special thank you PG tips is going to lay on the ultimate tea drinking experience for four lucky winners and their colleagues, You can all sit back and enjoy butler service and an all-round tea drinking oasis in your very own workplace by emailing thankyou@pgtips.co.uk stating why you deserve this treat. The lucky winners will also receive an amazing tea drinking kit, including a year�s supply of PG tips (four boxes of 240 tea bags), an eco kettle, a signed picture of Monkey, and a Monkey mug. So if you always make a cuppa for a friend when you put the kettle on, or you remember to buy your workmate�s favourite biscuits for tea breaks, let us know about it! Tea is the second biggest export in Kenya and so the way in which it is farmed has a big impact on the lives of the people in the country. The Rainforest Alliance Certified� status earned by PG tips� tea suppliers helps to ensure that tea farmers and their families receive a good education, good health care, housing and earn a decent income. Rainforest Alliance and PG tips are also helping to protect the natural habitat where tea is grown. As my Welsh teacher used to say. Of course I had no idea what she was going on about as my family were all from Essex. 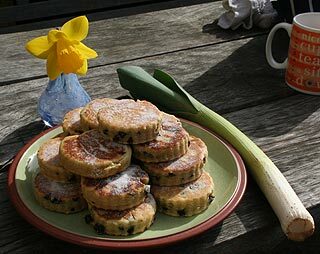 Yesterday being St David's day we decided to give Sue Northcotts traditional handed down Welsh Cake recipe a go, and here are the results, with supporting daffodil and leek. Having been raised in Wales, although being English, I really did appreciate the celebration of the Welsh patron saint's day, as it was basically a jolly. In primary school the girls would come dressed in traditional welsh dress, being a long skirt knitted shawl over their shoulders and mad Welsh hat, think Witches hat with the point chopped off. They would also have a daffodil pinned to them. The boys too came in traditional welsh dress, which was possibly what ever you normally wear with a leek pinned to you. Unlike the Prince of Wales's leek yesterday when he was on the telly, a small delicate affair, most were full size vegetables requiring a couple of safety pins and a bit of string to secure them to the child. Many boys would start eating their leek raw before morning break giving them an authentic welsh dragon breath by lunch time. Some of the boys who had the more feminine daffodils attached to them would eat them too in displays of male pride/stupidity. By far and away the best thing about St David's day was that it was half day at school. Even now well in to my forties I find that a March 1st that falls on a weekend seems like lost opportunity. I feel that somehow I've missed out on my afternoon off. It was several years into my working life before I could fully stop my self going home at lunch time on St David's day. 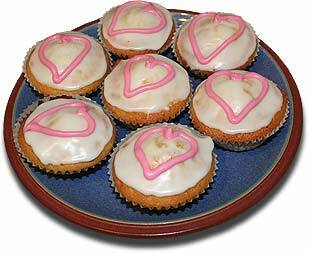 Well its February 14th and the romantic ones amongst us are no doubt planning something wonderful for their special love tonight. Here at NCOTAASD HQ the YMOS and myself see this as a perfect opportunity to bake some cakes whilst Wifey is out earning a crust. It may appear that this is merely a way of circumventing my diet, but it passes as romance here - right!